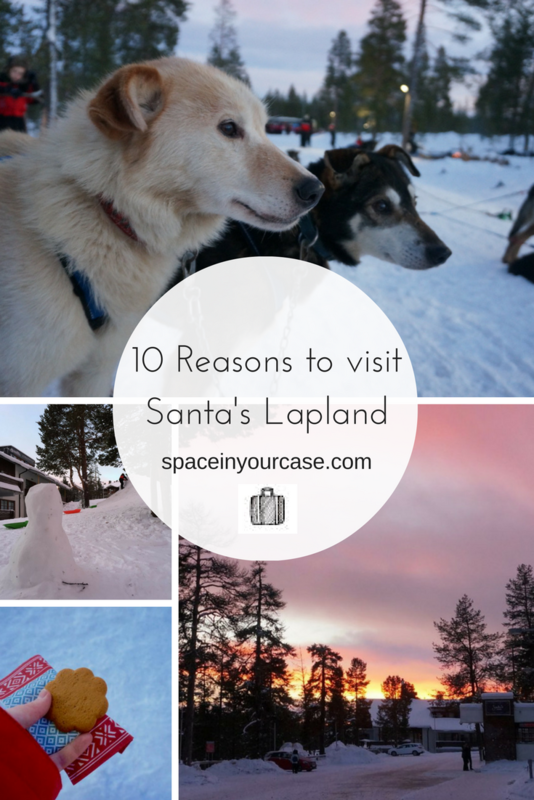 Penny recently travelled with Santa’s Lapland on the three day Magic of Santa trip to Saariselka, Lapland. 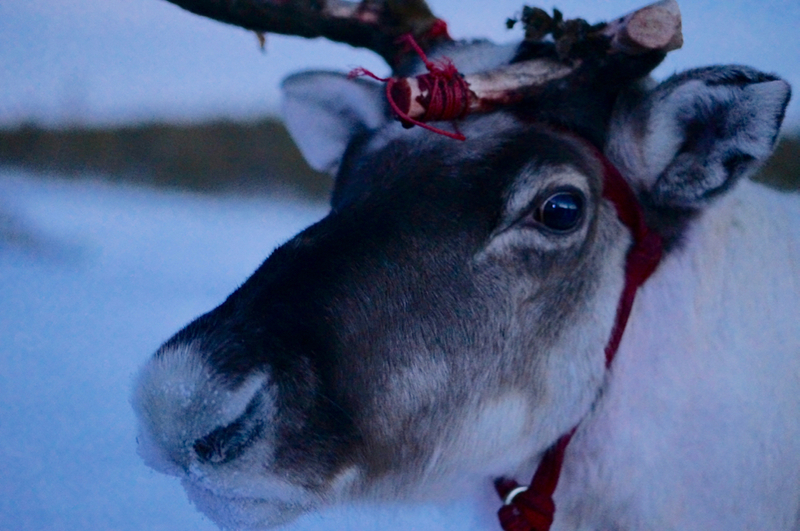 The middle day was a Search for Santa Day at the Artic Circle, including reindeer sleigh, husky sledding and a search for Santa’s cabin by snowmobile. It’s not the cheapest adventure, but is it worth putting this on your bucket list for December 2017? In the days before we left for Lapland I fully admit I was a grump, a grinch and a bah humbug, Christmas prep plus packing for the Artic seemed like a huge mountain to climb. The UK skies were a soupy grey which was doing nothing for my mood, venturing somewhere where it only goes light for 3-4 hours a day in Winter seemed like a slippery slope into full blown SAD. Expect Christmas tunes playing and the easiest flight you’ve ever had with small people. The staff will have you singing and passing balloons and parcels up and down the aisles. Remember to wear your Christmas jumper and buy some chocolate coins to eat! 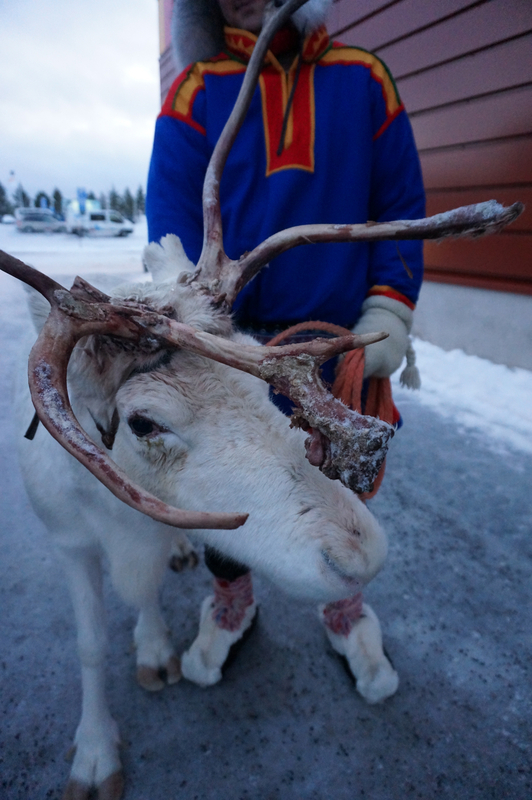 Stepping out of a plane onto snow at Ivalo Airport is thrilling, walking out of the airport and meeting a reindeer is surreal and beautiful. Reindeer lose their antlers in December, so while they may not be at their prettiest, they are the most magical creatures to meet. Expect to sing a lot on this trip, on buses, in queues, in the snow. No time to be bah humbug grumpy about this, hearing your children singing as you drive through snow covered lands is heart melting. I’ll bet it takes you back to your own primary school days too. I secretly loved this and missed the spontaneous bursting into song back in the UK. Luckily the kids kept it up. 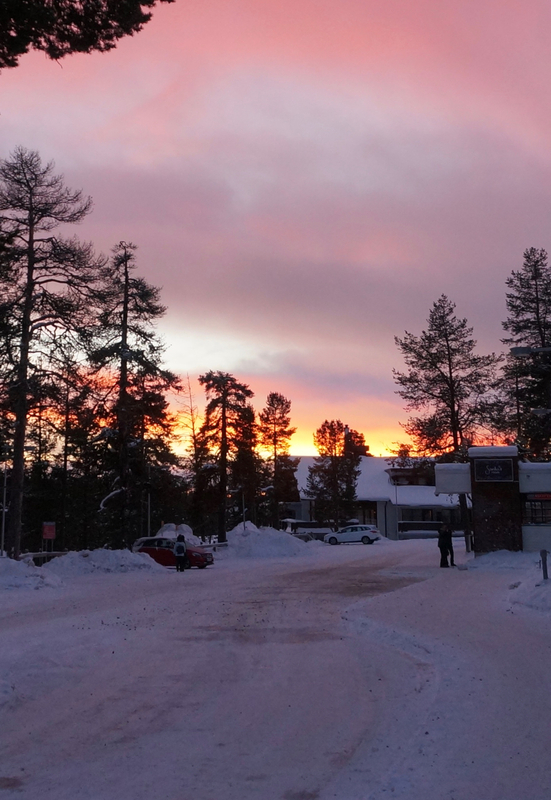 We stayed at Santa’s Hotel Tunturi, one of a choice of hotels offered by Santa’s Lapland. Our Finnish style accommodation was simple, clean, comfortable and very cosy. We loved snuggling on our sleigh bed, watching icicles on the balcony, making hot chocolates and the sauna was wonderful. The dining areas and food experience was hyyge filled – full of candles, snugs, antlers and pretty Scandi tableware. This was unanimously our favourite experience. As the kids sang and leapt about like penguins with the staff, the adults had a driving lesson. 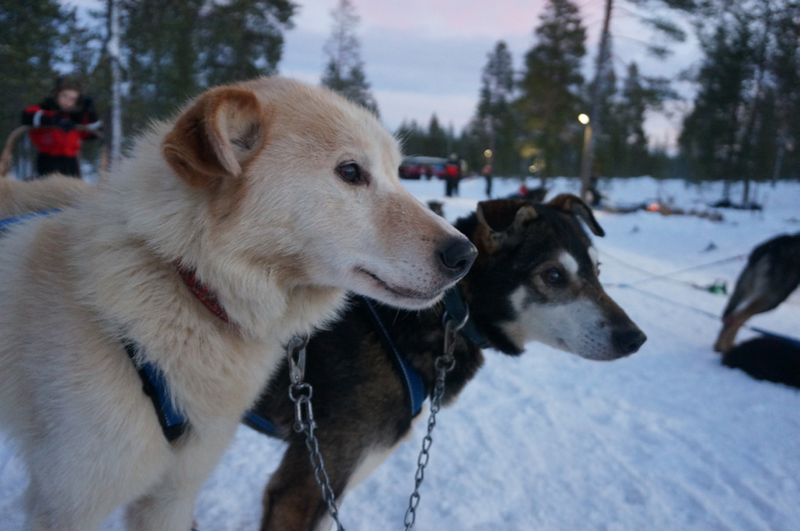 It’s thrilling when you discover you’re allowed to drive the sled yourselves, I felt giddy with the responsibility and high on life all snuggled up together in a family sled, but of course, the dogs are the ones who are really in charge. There is a mediative quality to the sleigh ride, slow and plodding across vast swathes of snow, through trees and under skies that seem to never end. A moment to hold your child close and reflect on a day full of adventures, as the daylight begins to slip peacefully away. No trip would be complete without Santa! A snowmobile driven sleigh, just for your family, takes you out into the wooded wilderness to find Santa’s cabin, ready for your meeting with the man himself. This was heart warming and full of giggles and unexpected surprises, like Santa reading from the actual letter you posted from the UK. Not a single complaint about cold, tiredness or hunger all day on our Search For Santa day. Why? Apart from the awesome adventures, there was free tea and gingerbread and hot juice and pancakes around the campfire in a pretty wigwam on tap. Plus a lovely lunch in a Scandi style lodge. How lovely are those serviettes too? It’s the little things and the pretty settings don’t you think? I can’t remember the last time we built a snowman together, or made snow angels. 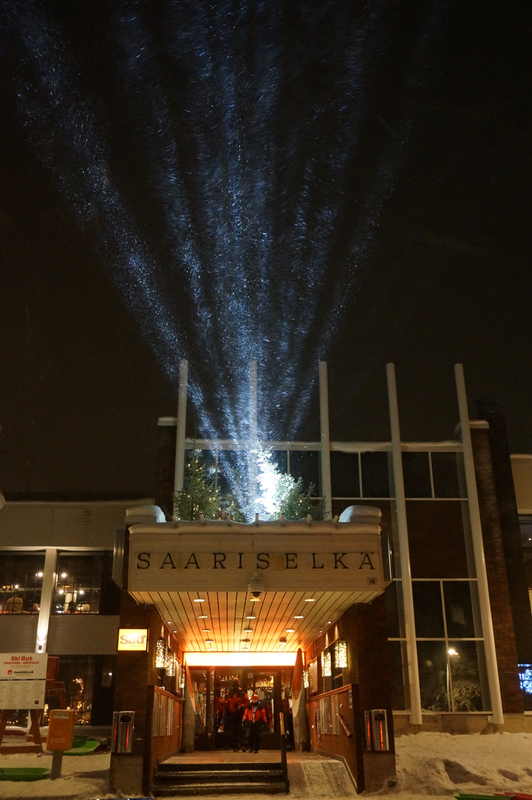 After our Search for Santa Day we had the best part of a day in Saariselka, a pretty and unspoilt resort with a sprinkling of gift shops and hotels next to Finland’s largest national park. The setting was wonderfully romantic, snow covered slopes and pine trees, pink candy floss swirled across the most magical turquoise sky. 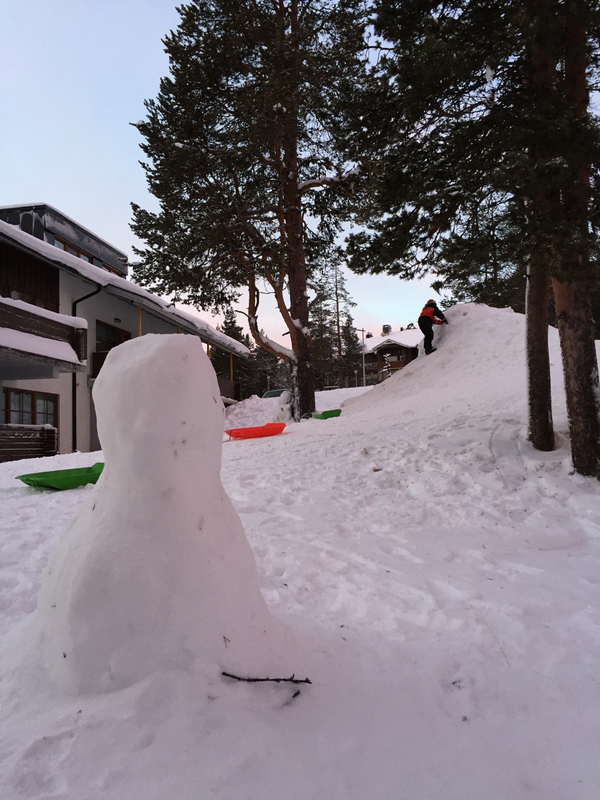 We sat and watched the kids building snowmen and felt like the luckiest humans alive. 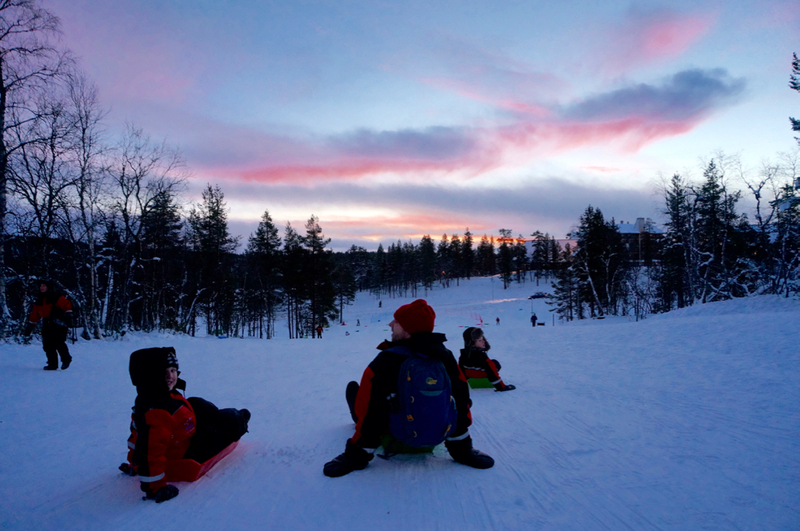 Just a short walk from the centre of the resort in Saariselka you have Finland’s longest toboggan run. Just incredible, and this photo is taken only part way up. Maximum points for exhilaration and excitement, every child and inner child’s dream. 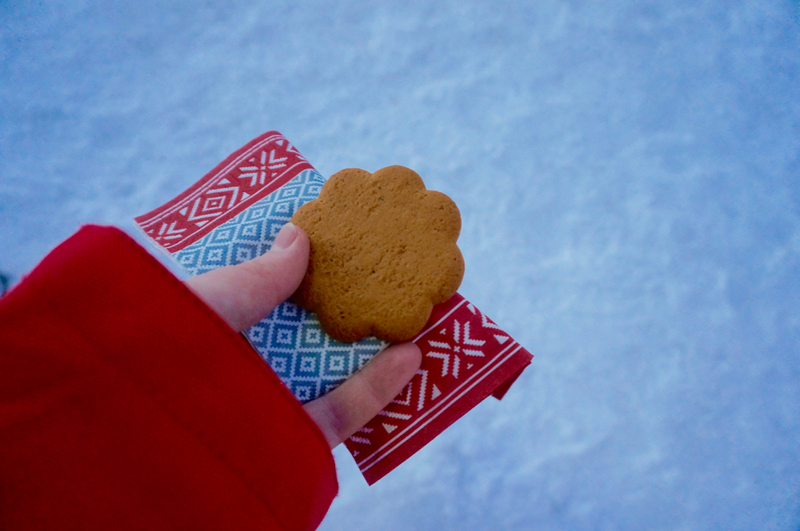 There is apparently a 50/50 chance of seeing the Northern Lights on the snowmobile adventure you can book onto separately, and hot juice and cookies too – what a completely magical experience to share as a family. By daytime the light is also incredible, it is daylight for about 4-5 hours, it’s truly amazing watching the sunrise melt into sunset. Try and get an early night in, it’s a big adventure, although 3 days gave us more time than I expected time to rest and explore either side of our big Santa day. 4 days would be perfect if you want to fit in more adventures, like the Northern Lights. 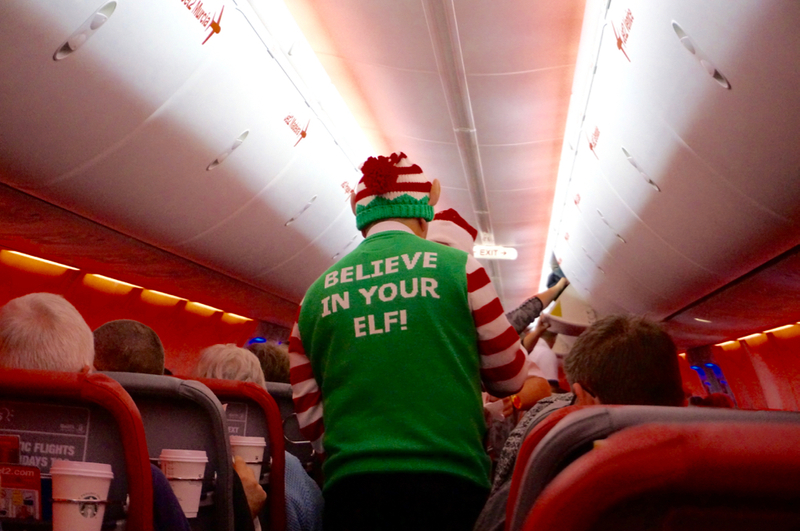 Definitely wear your Christmas jumper on the plane! Get ahead with Christmas prep to maximise your enjoyment. We loved escaping the Christmas rush and returning the day before Christmas Eve, but travelling earlier in the month might also set your festive thermostat! Invest in the right gear – you definitely need long thermal under layers which should be polyester or wool, not cotton. You can do this on a budget, or invest in wool ones. We picked up a set for each family member for under £15 each which did the trick. Hand warmers and spare gloves are great for kids. Fleece neck tubes or balaclavas are a fab way to keep everyone snuggly. You can also check the Northern Lights forecast online, I could see before we left we had a really good chance of seeing them, and you can book for the trip on arrival. Take extra batteries and phone chargers and keep them close to your body as batteries die more quickly in the cold. Ready to find out more now? Penny travelled to Lapland as guests of Santa’s Lapland on a three day Santa’s Magic Tour which includes flights, transfers, accommodation, thermal clothing, a Search for Santa Day including a Husky Sleigh ride, Reindeer Sleigh Ride, private meeting with Santa by Snowmobile to his cabin, lots of snow fun activities including ice fishing, tobogganing and skiddos, breakfast, and for those who book half board, dinner and a Gala Christmas dinner. Four day tours are also available and there are optional extra excursions like Northern Lights tours. Find out more about Santa’s Lapland and book for 2017. Free child places are available, but are limited, find out more here. Read a step by step account of this trip on Penny’s blog parentshaped. Pin to your bucket list! This is AMAZING! I visited Levi, Finland in Lapland last month and had an incredible time as well. Wish we had more time – I can’t wait to go back!